Divorce is inherently uncomfortable, so finding comfort afterward can be difficult. Seek the aid of a mental health professional when needed. Look for constructive ways of bettering yourself in post-divorce recovery. Ending a relationship is never easy. Ending a commitment that you expected to be a life-long partnership and journey through life together is entirely something different. In going through the divorce process, you are experiencing intense amounts of stress. Between the legal hurdles involved in separating one life into two individual ones and the emotional toll that it can take, you are going to need to surround yourself with support and find comfort along the way. That support starts with your family law attorney, who helps you throughout the legal experience and protects your future. They stand for you when the stress and difficulties of the experience may be too much at times. They can ease your burden by putting you in the best opportunity to succeed in your post-divorce life and create a path for you to recover from this challenging experience. During your life, the divorce experience may be one of the most stressful experiences you ever have. According to the Holmes-Rahe Stress Inventory from the American Institute of Stress, divorce is ranked as the second-most stressful event of a person’s life, only behind the death of a spouse. The stress of divorce is not an instantaneous occurrence that goes away after you experience it once. It ebbs and flows as aspects of it pop up, causing you to relive many of the emotions attached to the end of your marriage. You need to be able to acknowledge the stress and seek help with what ails you. That means understanding that with stress can come severe mental health issues, such as depression and anxiety. These issues need to be addressed, so that they do not spiral out of control. 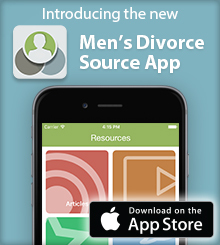 It can be challenging for those who have gone through a divorce to seek help afterward, especially men. You, as a man, may find yourself misidentifying what ails you, and according to a study published in the Sociology of Health and Illness Journal, men often interpret depression as stress. Additionally, the study found that the discourse for help-seeking for mental health issues was gendered, due to the masculine ideal that a man intolerant to pain does not seek the health care that they need. Because of the toxic situation that divorce can entail, you may misunderstand what you are facing and not get the proper help that you need. That help can be a comfort, and utilizing the help of a mental health professional who understands the challenges that you face and can engage you in a way to make you an active participant in your post-divorce recovery. In pursuing post-divorce therapy, you are taking steps to recover from the challenges that post-divorce life can entail. While you may not have as many assets or as much parenting time as you may want to have, you are working toward finding a comfortable place within your own skin in your post-divorce life. As small of an accomplishment as you may perceive that to be, it is significant in your post-divorce recovery. You are allowing yourself to feel your feelings and move forward from the challenges that the past entailed. You are moving past the tears and heart-break of a dysfunctional and unhappy marriage, and you are taking healthy and constructive steps toward forging a better life for yourself. In addition to seeking a mental health professional to gain perspective and let go of what ailed you during the course of the divorce experience, there are more constructive ways of pursuing comfort and a better post-divorce life. Just like therapy is a healthy and constructive way to channel your feelings, pursuing a healthier lifestyle is a way of improving your physical health and wellness. You can begin to eat better through meal prepping, and you can exercise and improve your physique. You also can work on your education. Many who exit dysfunctional and unhappy marriage utilize this crossroads in their respective lives to pursue a new career path or expand their current education level with an advanced degree. You simply may want to celebrate the end of your old life and the start of your new one with a tattoo or a divorce party, both of which are popular. Whatever method of comfort you choose, you need to make sure that it is right for you and that it will not set your post-divorce recovery back. You need to understand your means and work within them to satisfy your quest to build a better life for yourself.